The shaft of a golf club is often overlooked even though it is the most important factor for producing maximum distance, generating a desired ball flight and affecting the overall feel of the club. There are many different shaft properties, such as flex, torque, kick-point (bend or flex point), shaft length, and weight. All of these aspects play important roles in affecting the feel, distance, and ball trajectory. The most important factor in selecting a shaft is its flex. How do you determine what flex is right for you? Does your playing ability determine the flex? Is it the age of the player? Actually, these factors have little, if anything, to do with determining the correct shaft flex. The main determining factor in selecting the flex is swing speed. The higher your swing speed, the stiffer the flex you need. If your swing speed is more deliberate or slower, you need a more flexible shaft. When selecting driver or fairway wood shafts you will be looking only at graphite shafts and when selecting irons you will have a choice between steel and graphite. 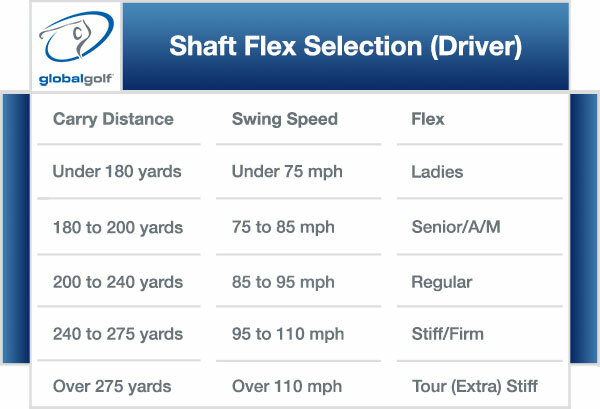 Listed below are the typical shaft flexes and a chart that shows swing speeds, carry distance and the appropriate flex for each speed range.